Inbound marketers are a special bunch. We’re hard working, creative minded, data driven people who recognize the endless possibilities in Internet marketing. There’s no doubt we see the world a bit differently which means we also possess a few quirks. Not sure what I’m talking about? Well then, to help you out, allow me to share a few things you may want to consider. 16. You end all your conversations with a call to action. 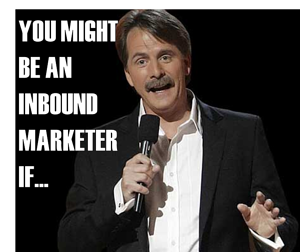 Are there any other quirks you can think of that make inbound marketers unique? Add them in the comments below and share this post with your peers so we all can smile.